Hey Midd students! Want to help in the rebuilding of New Orleans? No plans for spring break and would rather be near the sunny gulf than in Middlebury? Then here’s your opportunity! 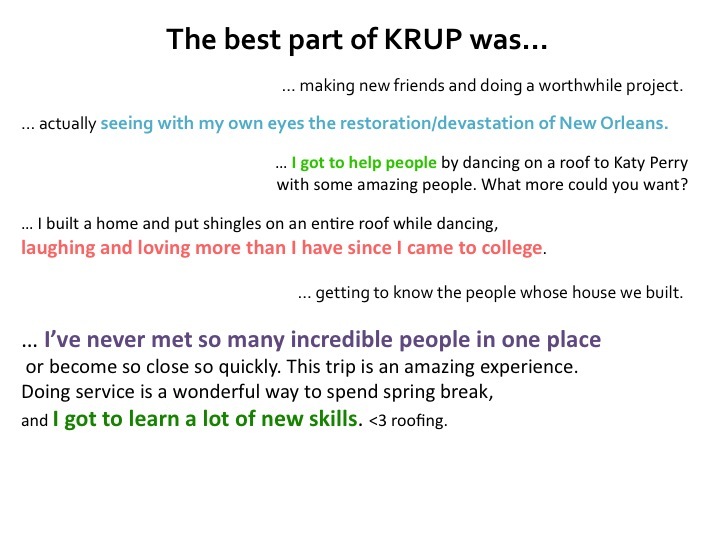 Last year, 34 of us went down to New Orleans over the break and contributed to the rebuilding of the city. We had a blast and worked hard! It’s been five years since Katrina, but the region is still in need of volunteer labor to revitalize areas hardest hit by the disaster. This trip is designed to explore the intersection of service, justice, and faith. The trip is sponsored Middlebury Intervarsity Christian fellowship (MCF) and everyone is welcome! Last year 2/3 of our group was not involved in any way with MCF. We will also be joined by groups from Brown, MIT, and UC Berkeley. 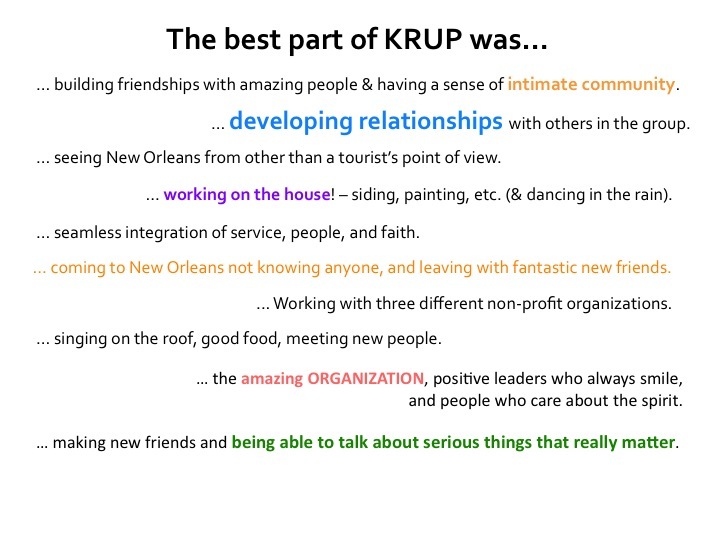 What happens on KRUP: Participate in continued the rebuilding effort in New Orleans for a week, building relationships and exploring the intersection of service, justice, and faith. Work on construction sites, helping to build new homes in the many neighborhoods still devastated by the hurricane! Take a tour of the city and spend some time exploring the French Quarter! Meet new people and begin some lasting friendships! 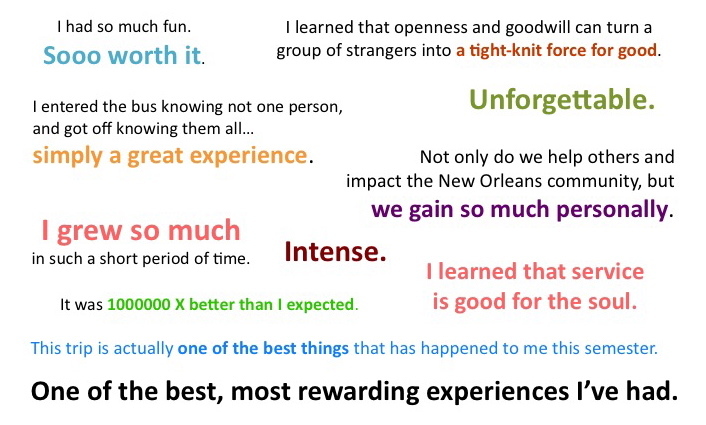 An important component of the trip centers upon the injustice that has taken place in post-Katrina New Orleans and listening to what local residents have to say about it. Evening “community time” will help us debrief what we’ve experienced in the city and discuss how the themes of faith, service, and justice help us to understand both ourselves and what has happened in New Orleans. Who: Open to all Middlebury students! Cost: Official upfront cost $575, but financial aid is available and all students’ costs are subsidized (at least partially) by group fundraising. In recent years, NO STUDENT HAS PAID OVER $300, and many have paid much less. A $100 deposit secures you a seat on the bus upon acceptance to attend the trip. 7:30 AM: Wake up, breakfast, get on bus. 830 AM – Noon: Groups help at worksites around city, partnering with non-profit organizations such as Habitat for Humanity, Rebuilding Together New Orleans, and the St. Bernard’s Project. 4 – 6 PM: Free time for hanging out, homework, napping. 7:30 – 9:15 PM: Community Time – Usually begins with activities to get to know one another better. Then in small groups, have sharing time to debrief from the worksites and have discussions based on intersection of service, justice, and faith. Other times, a New Orleans resident will come share his/her experiences from Hurricane Katrina and the recovery. 9:15 – 11 PM: Hang out, games, etc. During the week, take 2 trips into the French Quarter for free time to explore, shop, and eat (one afternoon, one evening) and take one bus tour of the city. Talent show on last night.